Two years ago when I persuaded Pam Kadlec, owner of Just Ducky Kennel, to sell me a Boykin Spaniel puppy, it was with the promise that I would work to enable Just Ducky’s First Edition (Edie) to fulfill her potential in the hunt field or in hunt tests. So, while I had started taking shooting lessons, it looked a lot more likely that we were going to give hunt tests a whirl instead of the hunt field. With Retriever Training for Spaniels in hand, we began clicker training and soon progressed to retriever basics. 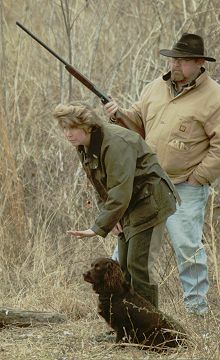 To get an idea of what this was all about, my husband, Welch, and I attended the 2003 Boykin Spaniel Society National Hunting Retriever Test. Since this is a breed specific - or specialty - event, the tests are not exactly like those run in sanctioned Hunting Retriever Club (HRC) events but they are very similar. After spending the weekend around all the little brown dogs (as we affectionately call our Boykins) we returned to Tennessee “bitten by the bug”. Our friends in Nashville were quite curious about the changes taking place in the Livingston household. “What makes a Junior Leaguer start wearing camouflage and knee-high rubber boots?” they would ask. We sent Edie back to Just Ducky Training Academy in late summer for advanced work. 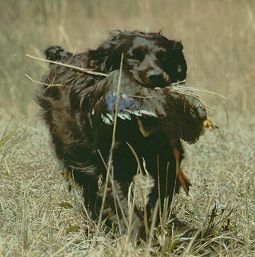 After just four weeks of professional training, she ran in a Carolina Boykin Spaniel Retriever Club Hunt Test and earned her first Started pass. We were on our way! Pam’s evaluation of Edie was quite prophetic, “She loves water and she hates feathers in her mouth.” With those words ringing in our ears we continued Edie’s schooling with our next hunt test just five weeks away. Bird boys are positioned behind V-shaped, portable camouflage blinds with wingers - which look like giant slingshots - and a bucket of freshly killed ducks or applicable game for the area. A gunner stands to the handler’s side and the judges are typically seated several yards away. When ready, the handler signals the judge, who in turn signals the bird boys. A duck call is blown, the bird is lofted into the air and the gunner fires a popper or live shell in the direction of the bird. Once the bird has fallen to the ground, the handler releases the dog and the game begins! 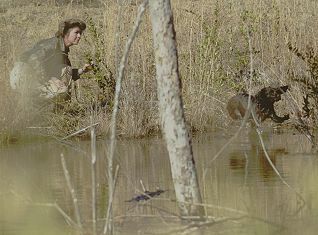 The Boykin event was the only hunt test I had ever attended, but I had a general understanding of the requirements for an HRC Started Hunt Test. 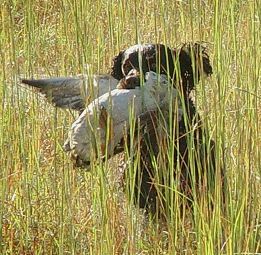 The first series is on land and consists of two single marked retrieves at a distance not to exceed 75 yards, followed by two single marked water retrieves at a distance not to exceed 60 yards. A Started dog is not required to deliver to hand and may be lightly restrained by a finger through the collar at the line. My husband always says that I try and cram too much into a short period of time, and I suppose he is probably right. Our first hunt test experience was certainly no exception. In the span of less than 24-hours, we drove to west Tennessee and celebrated our 5th wedding anniversary, awakened at 5AM to drive to the hunt test, earned our second pass, and returned to Nashville for a black-tie cocktail party on Saturday night. Whew! After that experience, we took the winter off (no duck hunting in our family) and then resumed training for a two-day hunt test at the end of February. Taking that much time off was a mistake and I seriously wondered if we would be ready to compete. We made the decision to enter and Saturday, February 28th dawned clear and cool. Deer River HRC sponsored the test, as well as the one the previous October, so we saw some familiar faces as we registered. After watching the big Labs lope along to pick up their land birds, Welch said that Edie looked like a motorized rat flying through the short stubble of the field. She may not like feathers in her mouth, but her enthusiasm gets some attention! With her land series complete, she had gathered a following and the best was yet to come. Welch and I were scared to death about the water series. The first one was through shallow water for 30 yards, not deep enough to swim, but not shallow enough for those Boykin legs to wade. The next series had a brush pile at about ten yards with the bird falling fifteen yards further out. My stomach was in knots as we approached the line. The judge observed that it was a shame for such a pretty dog to have to get in the mucky water and I thought to myself, “Yes, especially since she sleeps with me.” Edie bounded through the water like a champ and we had one down! The next bird fell cleanly and Edie went right through the brush pile on her way to get it. But, as soon as she was through the brush my heart stopped. She was swimming directly towards a floating stick and the duck was five feet away. All I could do was watch. When she reached the stick she realized her mistake, reared up in the water to find her duck - and nailed it! Hallelujah! By Sunday we had made a lot of friends, and I even found a training group to hook-up with for regular practice. Both series that day were solid and uneventful, but it wasn’t over yet. Unbeknownst to me, Welch had told the club president that a pass on Sunday would earn Edie her Started title. As the judges read Edie’s name everyone in the room began chanting, “Title, title.” I went to accept the ribbon and the judges turned then opened the doors of the building to reveal a lone folding chair surrounded by three 5-gallon buckets of water. I fondly recall Martin Mitchell, club president, devilishly saying, “Your dog got wet for you, now it’s your turn to get wet for your dog.” The accompanying pictures say it all.